China’s National Energy Administration published its official solar statistics for 2017 on Monday, revealing that the country had installed a total of 52.83 gigawatts worth of new solar capacity in 2017. 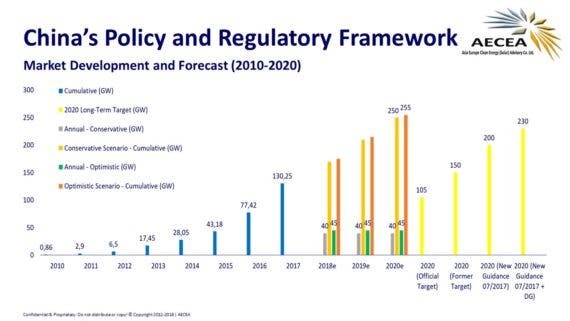 To its credit, BNEF did end up revising its predictions, but only after China had already installed 24.4 GW in the first half of the year, which included as much as 16 or 17 GW in the second quarter alone, 13.5 GW in the month of June, and 10.52 GW in July. BNEF was close, as China’s National Energy Administration announced its official figures for 2017, which came in at new solar capacity worth 52.83 GW. This brings China’s cumulative solar capacity up to 130.25 GW, around 7.3% of the country’s national power generation capacity. Looking at it another way, Chinese solar increased 53% year-over-year, or 68.7% in absolute terms over 2016. According to the independent Asia Europe Clean Energy (Solar) Advisory (AECEA), China added a total of 133 GW worth of new power generation capacity in 2017, including 12.8 GW worth of hydro and 45.78 GW worth of thermal power. This means that, for the first time in the country’s history, China installed more clean energy than it did thermal power. Further, AECEA expects that, when China releases more detailed statistics in the coming days, it will show that the country installed 19 to 20 GW worth of distributed solar, which represents a more than four-fold increase year-over-year.